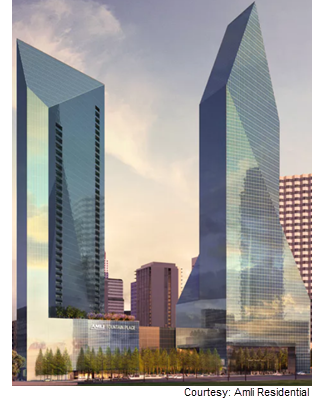 ​​ DALLAS – The 60-story, 1.2 million-sf Fountain Place tower is getting its first major makeover. The renovation of the rocket shaped​ tower includes adding a garage with ground-floor retail space and an outdoor plaza area, revamping the building lobby, and restoring the fountains surrounding the tower. Construction on the Ross Avenue tower started last year on the $70 million renovation and will continue throughout 2018. In addition to the Fountain Place renovation, a 45-story apartment tower is being built on tower’s north side parking lot. The 367-unit, $150 million apartment tower will take about two years to build. ​Check out DFW Multifamily and Office Market Research.